Algeria is home to many important archaeological sites due to the long history of human habitation of the region and fortuitous preservation provided from the dry climate of the Maghreb. Punic, Berber, and Roman peoples have all called the Algerian shores of the Mediterranean home at various periods of history. One of these sites of rich cultural heritage is Hippo Regius in Annaba, which lies on the banks of the Mediterranean Sea just west of the Tunisian boarder. Although visitors can walk through standing ruins of the Roman town, the Museum of the Ruins of Hippo contains artifacts which have been recovered from this seaside town. The ancient town of Hippo Regius cannot be fully understood divorced from its portable artifacts. The Museum is best known for its impressive collection of Roman mosaics. Each tessera, the tile that makes up the mosaic, has been meticulously cleaned and the mosaics preserved so these stone images can be enjoyed for generations to come. Subjects of the mosaics vary from depictions of the natural world to scenes from mythology and fantastical beasts. Some mosaics were formed into intricate patterns that adorned the floors of public buildings, such as churches. 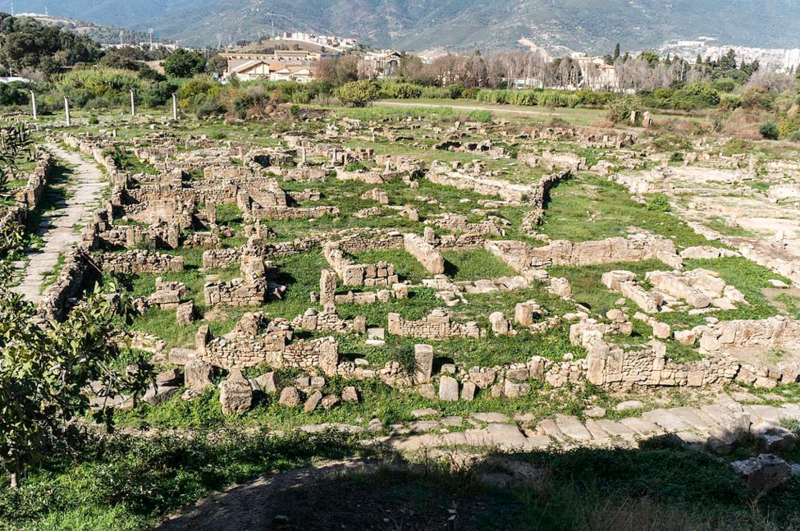 Roman ruins at Hippo Regius (Annaba), Dan Sloan. In addition to these beautiful mosaics, the museum also contains a variety of other artifacts from Hippo’s Roman period. An often-highlighted piece is a bronze military trophy in the form of armor hanging upon a post. Sculptures from the Roman forum such as that of the Emperor Vespasian are on display. Household items such as glassware, ceramic, and lamps provide insight into the day-to-day life of Roman Hippo’s citizens. Taken in conjunction with the ruins, the Museum of the Ruins of Hippo provides visitors with a holistic interpretation of the Roman city. Perhaps the resident most familiar to Europeans is St. Augustine, a Catholic priest who famously wrote his Confessions in Hippo; but as the museum demonstrates, Hippo was an important port city outside of the realm of religion. In fact, the city’s name “Regius” refers the town’s early role in the Punic period as the seat of the Numidian King Messena (New Catholic Encyclopedia). The opulent mosaics and finely carved statues illustrate Hippo’s regal past while the homely kitchen and house wares are a testament to the multifaceted lifeways of the city’s many residents.